In Hindu mythology, the Nagas/Nagis were a race of serpents whose purpose was to populate the underworld, Patalas. They were the 1000 offspring of the sage, Kasyapa, and Kadru, the daughter of Daksha. They are associated with weather (especially rain) & pictures of them are worshiped during times of drought. The Nagas are only malevolent to humans when they have been mistreated, and while their venom is deadly, they also carry the elixir of life and immortality. One story mentions that when the gods were rationing out the elixir of immortality, the Nagas grabbed a cup. The gods were able to retrieve the cup, but in doing so, spilled a few drops on the ground. The Nagas quickly licked up the drops, but in doing so, cut their tongues on the grass, & since then their tongues have been forked. 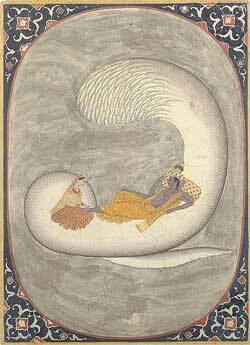 Sesha, whose name meaning “eternal”, is the world serpent who provides the bed for Vishnu as his heads give Vishnu shade. It is said he came into being when he sprang from the mouth of Bala-Rama as he was dying. He is depicted either as human in the form of Bala-Rama or as a serpent dressed in purple with 1000 heads, which cause earthquakes whenever he moves them. Also, at the end of each kalpa (1000 ages), he destroys the world with fire.